Parenting expert McCready reveals in this book that the solution is to help kids develop healthy attitudes in life. By setting up limits with consequences and training them in responsible behavior and decision making, parents can rid their homes of the entitlement epidemic and raise confident, resilient, and successful children. Whether parents are starting from scratch with a young toddler or navigating the teen years, they will find in this book proven strategies to effectively quell entitled attitudes in their children. Amy McCready is the founder of Positive Parenting Solutions, author of If I Have to Tell You One More Time . . . The Revolutionary Program That Gets Your Kids to Listen Without Nagging, Reminding, or Yelling, and a regular parenting contributor for Today. She lives with her husband and two sons in Raleigh, North Carolina. “I’m all for practical life hacks that make parenting easier, less stressful, and a whole lot more fun—and the strategies Amy McCready shares in The 'Me, Me, Me' Epidemic are both easy AND powerful for anyone juggling life and parenthood in today’s hyper-connected, instant gratification world. This is a must-read book, no matter the age of your kids. There are as many great tips in here for teens as there are for toddlers! 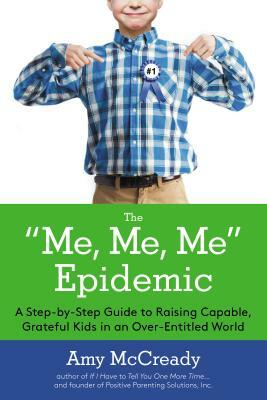 "The ‘Me, Me, Me’ Epidemic is a must read for every parent. As a parenting professional and a parent, Amy McCready knows, firsthand, the negative effects of entitlement on a family. Interspersed among realistic anecdotes (you may wonder if she is listening at the door of your house) Ms. McCready presents a thoughtful, developmentally based, respectful approach to detangling yourself and your family from the insidious entitlement web." "McCready covers a wealth of suggestions for helping kids become un-entitled, along with scripts parents can use and ideas for various ages from pre-school to teen. This user-friendly guide is overflowing with practical, creative, and thoughtful strategies." "A guide to stopping the helicoptering, lawn-mowing, and overindulging that can lead to entitled, self-centered thinking in children. McCready sorts out the sensible from the nonsense. Given the competing noise about parenting, this book should be required reading for parents."